We didn’t have to hire an EDI specialist and delivered the solution with internal resources. Customer Wells and Young's Brewing Company is the UK's largest privately owned brewery and a leader in cask beer and premium lager. Challenge Sending EDI transactions via a VAN broker was expensive and didn’t give end-to-end visibility. Solution Use LANSA Composer to deliver an EDI AS2 solution. Use the same technology to formalize all formal data exchange, both with external partners and between internal systems. Key Business Benefits Reduced EDI expenses, quicker customer service. Key IT Benefits All solutions delivered without the need for EDI or Integration experts. Being able to standardizing on the same technology for diverse integration requirements brings efficiencies as well. Editors note: Since publishing the case study, Wells and Young’s went back to its roots and now trades as Charles Wells again. Charles Wells usage of LANSA Composer has extended far beyond the solution featured below. Wells and Young's Brewing Company is the UK's largest privately owned brewery and a leader in cask beer and premium lager. The company's portfolio includes some of the UK's best loved beers and premium lagers. Wells and Young's is standardizing on using LANSA Composer for its EDI communication with external parties, as well as for establishing a formal process for exchanging customer product information between its ERP implementation and various other internal systems. Phil Bly, Head of IT at Wells and Young's, says "With LANSA Composer we now have a toolset that enables us to do native EDI AS2 transmissions directly to our distributor. From an IT point of view that gives us total end-to-end visibility. We didn’t have to hire an EDI specialist and managed to deliver the solution in just over eight weeks. The process is now far more efficient and we enjoy significant savings." We now have a toolset that enables us to do native EDI AS2 transmissions. 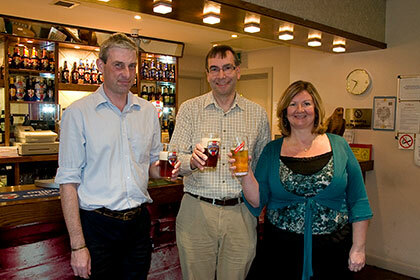 Phil Bly, Head of IT (middle) with his project team Colin Lapping and Karen Rich. Wells and Young’s beers are brewed using techniques over a hundred years old, but in one of the country’s most modern breweries. Wells and Young’s Brewing Company was formed in 2006 from the brewing and brands divisions of Charles Wells Ltd (based in Bedford) and Young and Co plc (based in Wandsworth), to form Britain’s largest private brewery. Wells and Young’s is operated as an independent company and both Young’s and Charles Wells continue to operate their pub estates independently of each other. The large volume of orders and deliveries of the merged organization required a change in logistical procedures. Soon after the merge Wells and Youngs started a program to outsource its secondary deliveries (pubs) and primary deliveries (wholesalers and retail chains). A blue chip logistics company was chosen to initially take on the secondary deliveries for what were previously the Young’s deliveries in the London area. This external service was then extended to cover the primary operation and, finally in 2009, the secondary deliveries for the Wells Bedford operation. "So our total distribution has gone to a single third party," comments Bly. "From a systems point of view, this meant that we had to feed all the order information to our distribution partner. Previously we did this by extracting order information from our System21 ERP into a flat pseudo EDI file, which we transmitted to our message broker. The broker would translate our pseudo EDI file to proper EDI transactions and transmit these via another VAN (Value Added Network) to our distribution partner." "With our large volume of data and the utilization of a message broker and VAN, the EDI transmission became quite expensive. So, that was a good driver to make changes to the EDI process." "But of equal importance to us was that we had no end-to-end visibility. If something didn’t work as expected after the file had been transmitted , we didn’t know where it went wrong. The orders could be stuck either with our message broker, they could be stuck at the second VAN or maybe our distribution partner had never processed them. There were just too many links in the chain." There was also a timing issue, according to Bly. "After each transmission, we had to wait for an acknowledgement to come back from our distribution partner before the next batch of orders could be sent. The process of sending out a batch of orders and waiting for the acknowledgement could take up to an hour, because of the multiple steps and parties involved. "If we encounter data or transmission problems, especially at the end of the day, distribution costs could escalate. The standard industry procedure is to place an order on day one and receive the goods on day three. If one day is lost because of EDI problems, then the distributor has effectively been given one day's less notice, which has a cost implication." "Efficient EDI communication with our distributor is critical in getting product on time to our customers, so we started to look for a solution that let us speedup the process and give us better visibility," explains Bly. "We wanted a toolset that would enable us to do native EDI transmissions with re-usable components directly from Wells and Young’s, rather than going through a VAN/ message broker. Efficient EDI communication is critical in getting product on time to our customers. "Initially we looked at a specific EDI software package. It was good at generating EDI, but it was too complex and didn’t solve some of the problems we had. We needed an AS2 solution, as well as mapping and translation into the TRADACOMS format." Bly was already aware of some of the LANSA tools and with further research he became aware of the LANSA Composer product. "LANSA Composer’s AS2 solution with its facility to map to EDI formats like TRADACOMS gave us exactly what we needed," says Bly. "From an implementation point of view, everything went smoothly and without problems. The few small issues we had were fixed very quickly. Also, the solution was easy to integrate with our ERP system. "We didn’t have to hire an EDI specialist for this project. We managed to deliver the solution with internal resources using Composer’s mapping facility and examples for TRADACOMS. We now have a mechanism in place to take the raw data as we extract it out of our ERP and compose that into the standard TRADACOMS EDI format and transmit that using AS2." "We achieved the budget savings that we were looking for. We save significantly in transmission costs by sending orders directly to our distribution partner and not having to use a VAN/ message broker service. There are other savings and efficiencies as well," continues Bly. "The moment our distribution partner receives our orders, they process them immediately and send their acknowledgement back to us. This cycle now takes an average of 10 minutes to turnaround, rather than the 40 to 60 minutes it took previously." "The new EDI system was implemented without any problems. Those ‘end of the day’ pressure situations where we cannot get our orders through before 6:00 pm have disappeared, together with the penalties that apply in those situations. We have good control over what we are sending and get a quick turnaround." "From an IT point of view we now have total visibility," continues Bly. "We know the exact status of each transmission and where our orders are at. In case of any delays, it’s between us and our distribution partner and we can get to the right people quickly. We don’t have to call multiple third parties to find out what’s going on." Bly also used LANSA Composer to implement several other EDI solutions, including a solution for Advanced Shipping Notifications (ASN). "LANSA Composer is becoming our standard middleware for any external communication and internal ETL (extract, transform and load) solutions," comments Bly. "Because LANSA Composer lets us work at a high level, the solutions we have created seem all very similar from a technical point of view, even though some of them had a completely different EDI protocol underneath." We save significantly in transmission costs by sending orders directly to our distribution partner. Bly and his team are in the process of re-engineering EDI solutions that were put in place before they had LANSA, both for inbound and outbound EDI. "We are working towards making LANSA Composer our common platform for all inbound and outbound EDI communication," explains Bly. Bly also plans to use LANSA Composer for data integration between its internal systems. "We want to establish a formal system based process for managing information between the various systems that we use," explains Bly. "We are standardizing on using LANSA Composer as the glue between our System21 ERP and formal communications with other systems." These systems include the Aurora ERP solution, Kelros CRM, Lotus Notes and an in-house developed Enterprise Information System (EIS). Standardizing on LANSA Composer will not remain restricted to ERP integration (which involves IBM i for Wells and Young’s). Bly is in the process of using the same LANSA Composer technology in Windows and SQL Server based environments as well. "Integration between the IBM i and Windows-based solutions is of importance, as well as integration between various Windowsbased solutions. LANSA plays a big role in all system and data integrations," concludes Bly. We are standardizing on LANSA Composer for all formal communications between systems. Wells and Young’s Brewing Company was formed in 2006 from the brewing and brands divisions of Charles Wells Ltd and Young and Co plc, to form the UK’s largest private brewery. After Wells bought the 40% stake of Youngs, the company went back to trading as Charles Wells again.